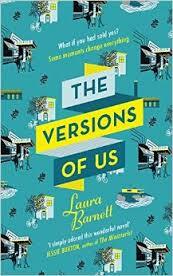 Well, you will be pleased to know that I have finally finished my latest read "The Versions of us"
....and to be honest I feel very pleased that I have finished this book too! I had high hopes for this novel, I loved "Life after Life" by Kate Atkinson, "The Time Travellers Wife" is one of my all-time favourite reads, and I thought Sliding Doors was a cracking film. Why then did this novel, which seemed so influenced by all of them leave me so decidedly luke-warm? The novel is the story of Eva and Jim's life told in triplicate. The story begins with the same moment when the two are at university in Cambridge and Eva falls from her bike. In versions one and three Jim helps her up and in version two he doesn't. The stories diverge from that point and tell three different versions of their lives. In each story their lives are intertwined, and there are key moments that are shared (although different) in each version. The idea is a really interesting one, unfortunately the novel skips between versions each chapter and it becomes really difficult to keep up with which story you are in, who's who and what has happened. I almost resorted to writing notes to keep up! Perhaps my brain has become addled over the last few years with children, lack of sleep, and the rigours of daily life, but honestly....this just felt like hard work! Don't get me wrong, I like a book to challenge me, I don't want to be bored and I like new concepts, but the fact is that I didn't care enough about either Eva and definitely not Jim to make me want to do the leg-work to get through it. Saying that, the book does make some interesting points - such as; life is never perfect, whichever way you choose to live it, the decisions we make can have ripple effects throughout our whole life, and it questions what true love really looks like. All in all though, what a disappointing feeling it is to have gotten to the end of the book and realise that I haven't really enjoyed the process, that I have only finished it because I want to make sure I can follow the discussion at book group this week! The realisation of all those hours that I have spent reading something that I didn't love and which could have used on something that I actually did enjoy! It's at those moments that I remember how precious time really is, how little of it there actually is, that it slips away before you even notice it. Sadly I don't believe that there are multiple versions of my life for me to live, and that if I don't make the most of this one then that is it! I made my first ever loaf of bread this week. It was totally yummy if I do say so myself, although it didn't last too long once The Big Guy got his hands on it! And Child 2's new blanket is hooking along very nicely I think. I have an unexpected day with a poorly Child 1 at home today, which means that not much in the way of work is going to get done, but there will be the chance for some chat, some quiet time together, and the more I think about it I guess that is what I think it is all about - making the most of the version of life that I have got. If you get the chance please let me know what have you been reading lately, I would love to hear your recommendations, and how do you feel when you get to the end of a book that you haven't enjoyed? ?